Welcome Back! Today I'm tacking another portion of my #UPGRADEMYLIFE journey! Teeth! My Smile! It's been a big thing for me for a while now, not feeling good about my smile! 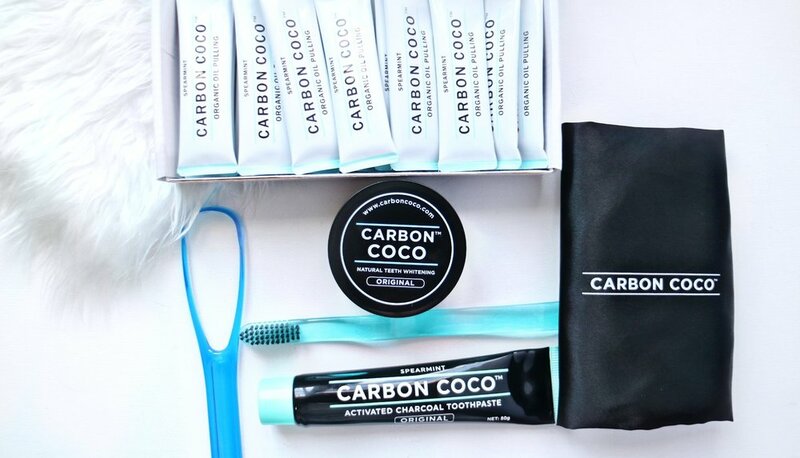 So I decided to try the popular Carbon Coco Natural Teeth Whitening kit! Scroll down to see if I liked it! So Let's dive right in! I'm usually REALLY skeptical about instagram popular items! Especially when they just pop out of no where, however this product really struck my interest! So I spent some time just watching it, reading reviews and waiting to see if the hype would last. It has! So I dove in and purchased a whitening kit! There customer service is really great btw! After about 5 days I started to experience some sensitivity with the amount of brushing that's required - in my opinion that's really specific to me as I haven't been able to visit a dentist in TOO long, so the inflamed gums was a personal reaction, not something I think others would have to worry about- Nonetheless I pulled back a bit, only using the tooth paste two days and then the inflammation went down! The oil pulling is something I stopped doing after 4 days, not because I didn't like it, just because it took A LONG time. My intention is to do it over the weekends! It REALLY does make your mouth feel cleaner. Overall ALL products give you that just came from the dentist feeling! So these before and after photos are insane. I was originally embarrassed to post these but then I decided. I'm on a journey, I'm upgrading so I have to be able to embrace the past before I can step into the future so here we go! THAT'S HUGE FOR 10 DAYS!!! And what you can't see is how my overall mouth FEELS!! OhMYGaaash!!!! Here's a pic from today - marking day 13! So to say the LEAST --IT WORKS!!! I'm SOOO pleased with the look of my smile and the feel of my mouth, my gums! This process has been sureal and I'm SO excited about the results I'm going to invest in a kit for a family member of mine who was shocked by my results! So there you have it ladies & gents (maybe lol) I LOVE carbon coco and fully support it! What is ONE thing you would love to change/fix/upgrade in 14 days other than your smile? Would you try Carbon Coco?!! Let me know in the comments down below!